Langley – The Grand River Dam Authority is reminding area residents that Grand Lake’s elevation will be at 743 foot, with very-inviting water conditions, for the upcoming Labor Day holiday. 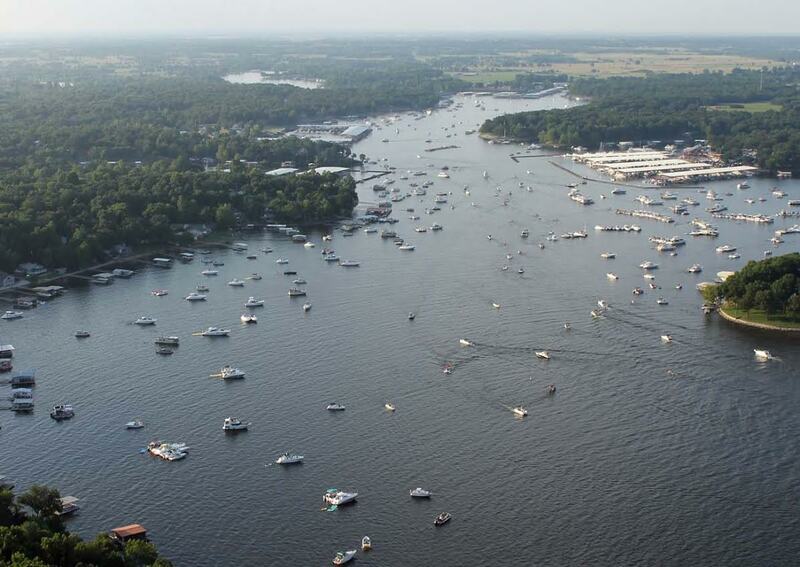 GRDA was successful in its recent request to the Federal Energy Regulatory Commission (FERC) to maintain the lake at the higher elevation through Labor Day weekend, considered to be one the most popular boating weekends on the lake each year. In year’s past, GRDA has been required to lower the lake to 741 feet by September 1, however in August FERC gave its approval to a GRDA request to keep the lake at higher levels for the holiday weekend. As area residents prepare for the popular holiday on the water, GRDA is also sharing its safe boating reminders. Using common sense, taking extra precautions in crowded lake areas, wearing life jackets and simply boating “safe, smart and sober” are all ways to promote safe, memorable outings. Although the lake level will be near normal, it is always a good idea to check the water conditions before you head out. Know where the hazards, like sandbars or stump beds, are located in the water. Life jackets save lives, but they don’t work if you don’t use them. If you need assistance on the waters of Grand or Hudson lakes, the GRDA Police recommends you call 911. However, if you are on the boat with no cell phone access, you can use Marine Band 16 to radio for help. The GRDA Police Department is also reminding boaters that new rules for boating in Grand Lake’s Woodard Hollow are now in effect. Those rules were developed after GRDA received input at public meetings in late 2014. All watercraft wider than 8.5 feet shall operate at “idle” and avoid producing a wake at all times in Woodard Hollow. If the vessel is wider than 8.5 feet, Woodard Hollow is no wake for the vessel at all times regardless of length. All watercraft longer than 30 feet shall operate at “idle” and avoid producing a wake at all times in Woodard Hollow. If the vessel is longer than 30 feet, Woodard Hollow is a no wake for the vessel at all times regardless of width. All watercraft smaller than both measurements listed above may operate on plane not to exceed 30 mph in Woodard Hollow from official sunrise to official sunset. All watercraft must stay at least 150 feet away from any dock, breakwater, structure, or shoreline at any speed above “idle”. GRDA also reminds you that Labor Day weekend is your last chance to take advantage of this summer’s free tours of historic Pensacola Dam. Not only is the dam Oklahoma’s first hydroelectric facility, but it is also a member of the National Register of Historic Places. Completed in 1940, the dam is now in its 75th year of service to Oklahoma. Tours originate from the GRDA Ecosystems and Education Center, located just west of the dam. If you are planning on taking the tour, remember to wear comfortable shoes (there is a fair amount of walking involved) and dress for the weather. All persons over 18 are required to present some form of ID. For more information, call the tour desk at (918) 256 0803. Finally, please be aware of the signs, buoys, sirens, fencing and flashing lights you may see around GRDA hydroelectric facilities (Pensacola Dam, Robert S. Kerr Dam and the Salina Pumped Storage Project). These are all intended to notify you of areas where water may rise swiftly, no trespassing or no diving is allowed or footing is unstable. Whether you are coming to the water, to the shore, to the dam tour or, perhaps all three, GRDA encourages you to keep these tips in mind as you enjoy the Labor Day weekend. For more information on the GRDA Police Department or, for information on how an officer can assist you, contact the department at (918) 256 0911 or visit online at grda.com. Headquartered in Vinita, GRDA is Oklahoma’s state-owned electric utility; fully funded by revenues from electric and water sales instead of taxes. GRDA’s electricity touches 75 of 77 counties in the state and serves as an important economic development engine for Oklahoma. At no cost to Oklahoma taxpayers, GRDA also manages 70,000 surface acres of lakes in the state, including Grand Lake, Lake Hudson and the W.R. Holway Reservoir. Today, GRDA’s 500 employees continue to produce the same “power for progress” that has benefited the state for 75 years. The efforts of Team GRDA facilitate over $450 million in economic activity in Oklahoma annually. PreviousBoating Tips – Who Has The Right-Of-Way? Could you tell me who took the picture of Summerfield Cove? (the one at the first of your publication) I live on the cove and would love to get a better copy. Love your news letter it’s always good to be informed. Hi Jayne – The easy answer is GRDA. They sent that out to me – and other area publications – earlier this summer as part of another press release. Beyond that I do not know. You might contact Justin Alberty at GRDA and see if he can help you.